One of the things we do to keep track of vulnerabilities in WordPress plugins for our Plugin Vulnerabilities service is to monitor the WordPress support forum for threads related to them. In addition to threads that actual relate to that issue, we frequently run into to other security related threads. In doing that we noticed that in many threads a reply containing the same advice is given, which consisted mainly of a series of links. Some of the pages linked don’t seem to provide the best information, so we wondered if the various members providing that reply were actually aware of what they were linking to or if they were just repeating something they had seen others saying. While looking into another issue involving the forum we found that the source of the message was from a series of pre-defined replies for moderators. Sucuri is showing my site as harmful and is asking for $16/month to fix it, yet my site seems fine, traffic is normal and I have no log in / access problems on any browser or device. 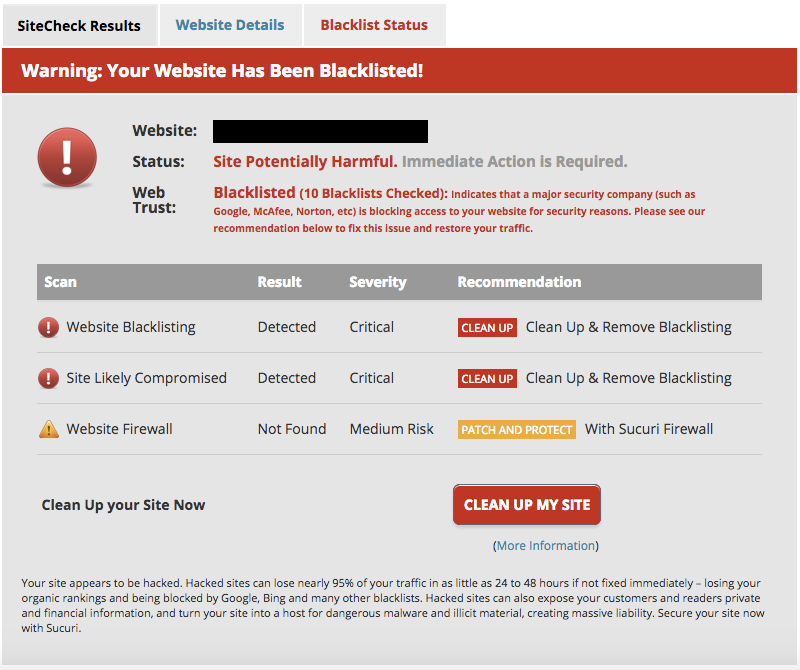 It seems to us that a service would be careful in situation where they are not themselves detecting anything malicious, but Sucuri seems to be labeling the website as “Site Potentially Harmful” and “Site Likely Compromised” based only on the fact that Norton Safe Web was blacklisting it. 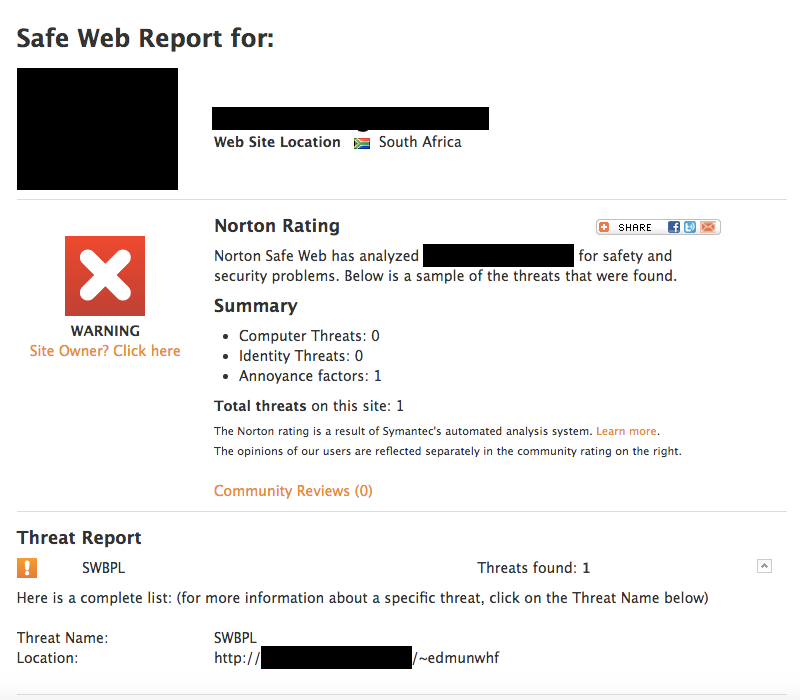 Based on our limited experience with Norton Safe Web, that would seem to not be appropriate because the results we have seen from it in the past have been rather poor. Looking at what they are claiming to have detected with this website makes us more confident of the position. So Norton is apparently warning about the website based on unidentified third-party’s data, which is also apparently prone to a “few” false positives. That doesn’t really seem like something that should be the source for Norton warning about a website and certainly shouldn’t be used by someone else to make claims as to the security of the website. Looking at the URL they identified as being a “SWBPL” threat, visiting it normally just returns a “Page not Found” message and when visiting it in some other ways didn’t produce any different result. Without having access to the backend of the website we can’t rule out there is some issue with it, but from the outside there is nothing we could find harmful about it. We hope that WordPress will review the boiler plate message they provide to those with questions about hacked websites and consider if they are providing the best information in it.